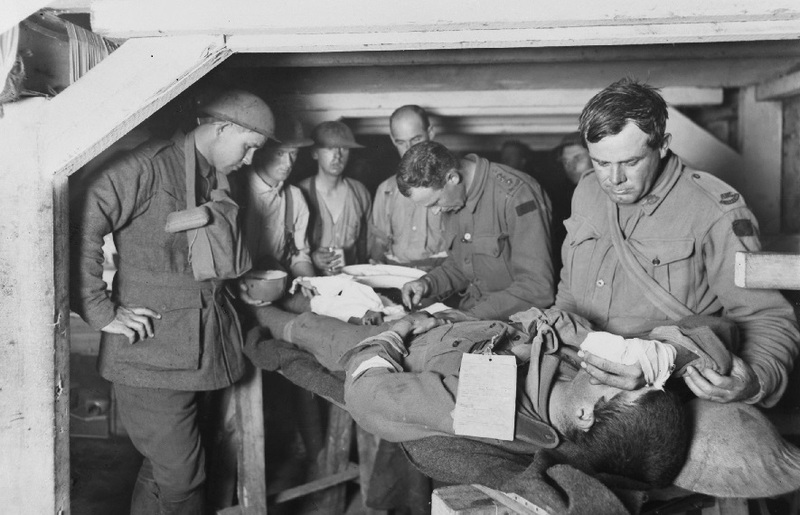 The 3rd Field Ambulance was the Field Ambulance Company that belonged to the Third Brigade of the First Division, comprised of 9th 10th 11th and 12th Battalions, all of which were drawn from the "outer States", namely Queensland, South Australia, Western Australia and Tasmania respectively. The 3rd Brigade were the first to land at Gallipoli on the 25th April 1915 as the Covering Force and the Field Ambulances were soon in action being established near the beach. Significant numbers of South Australians saw service in the 3rd Field Ambulance and indeed the unit exists to this day as a sub unit of the 9th Combat Service Support Battalion at Warradale in Adelaide's southern suburbs. Perhaps the most famous members of the 3rd Field Ambulance were Private John Kirkpatrick Simpson and his donkey, who famously evacuated casualties for hte Gallipoli fighting to the beach head until Simpson was killed by a Turkish machine gun on 19 May 1915. The RAPs served each Battalion (or other units) and were manned by the Regimental Medical Officer (RMO), a qualified doctor generally of Captain rank supported by several non-commissioned officers (NCO) of Sergeant and Corporal rank, with a number of medical orderlies at the rank of Private. They would have to deploy forward to reach the RAP, and thus come under the same risks as the front line combat troops. They may have had a number of means to assist in casualty evacuation from light rail, horse drawn vehicles and even motor vehicles. Or they could indeed also be stretcher borne. On Gallipoli, the Field Ambulances were 'on the beach'. Subsequent evacuation was by ship to Lemnos Island, then to Malta and ultimately to the United Kingdom where soldiers might be hospitalised for many months. Then they would undergo rehabilitation, either in the UK or in serious cases they might be repatriated back to Australia. Many of the wounded succumbed to their wounds in transit. They would be buried at sea in the traditional naval fashion.